Oldspeak:“If there’s one thing this latest do-nothing Congress does well it’s draft bills to take things away from you. On the heels of a bill to indefinitely detain Americans without cause or charge , we have a bill that won’t do what it’s supposed to do, (fight piracy), but will put American internet censorship at the same level it is in CHINA. ‘Any holder of intellectual property rights could simply send a letter to ad network operators like Google and to payment processors like MasterCard, Visa, and PayPal, demanding these companies cut off access to any site the IP holder names as an infringer.’-Mike Masnick ‘You can be found “dedicated to the theft of US property” if the core functionality of your site “enables or facilitates” infringement. The core functionality of nearly EVERY internet website that involves user generated content enables and facilitates infringement. 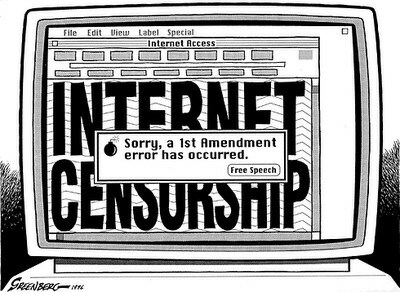 THE ENTIRE INTERNET ITSELF ENABLES OR FACILITATES INFRINGMENT.’-Joan McCarter Under the oft used guise of “security”, media corporations; ‘intellectual property’ owners like Viacom, Universal, Paramount, and Monster Cable will get to compile lists of “rogue sites” “dedicated to infringement”, to be targeted for shutdown, while providing no substantive evidence of infringement. In reality, the goal is to stifle free speech and competition. Censorship. As American as apple pie. Because forcing austerity on the nation isn’t enough to keep Congress occupied and off the streets, they’re also plotting against the internet with SOPA, the Stop Online Piracy Act in the House, and PROTECT IP in the Senate (BANANAS alert if you click that link). In a generally deadlocked body, this one seems to be on the fast track, potentially coming up for a vote in the Senate as soon as Dec. 5. Imagine a world in which any intellectual property holder can, without ever appearing before a judge or setting foot in a courtroom, shut down any website’s online advertising programs and block access to credit card payments. The credit card processors and the advertising networks would be required to take quick action against the named website; only the filing of a “counter notification” by the website could get service restored.It’s the world envisioned by Rep. Lamar Smith (R-TX) in today’s introduction of the Stop Online Piracy Act in the US House of Representatives. This isn’t some off-the-wall piece of legislation with no chance of passing, either; it’s the House equivalent to the Senate’s PROTECT IP Act, which would officially bring Internet censorship to the US as a matter of law. If that sounds a little alarmist, it isn’t. Mike Masnick at Techdirt, in the “definitive post on why SOPA and Protect IP are bad, bad ideas” walks through the extensive list of problems with the bills. The real fear is the massive collateral damage these bills will have to jobs, the economy and innovation. It’s possible that with enough support for the filibuster, leadership gives up on bringing this to the floor in the near future. After all, they’ve got an awful lot to get through between now and Christmas and if Wyden can find several senators to support him, they can threaten to tie things in the Senate up enough that the vote has to be postponed. That, along with Microsoft’s opposition to it, might just do the trick. The police brutality against peaceful protesters in Berkeley, Davis, Oakland and elsewhere is bad enough. But next week, Congress will vote on explicitly creating a police state. The senators pushing the indefinite detention proposal have made their goals very clear that they want an okay for a worldwide military battlefield, that even extends to your hometown. An article in the Army Times reveals that the 3rd Infantry Division’s 1st Brigade Combat Team will be redeployed from Iraq to domestic operationswithin the United States. The unit will soon be under the day-to-day control of US Army North, the Army service component of Northern Command. The Army Times reports this new mission marks the first time an active unit has been given a dedicated assignment to Northern Command. The paper says the Army unit may be called upon to help with “civil unrest” and “crowd control”. The soldiers are learning to use so-called “nonlethal weapons” designed to subdue unruly or dangerous individuals and crowds. This violates posse comitatus and the Constitution. But, hey, we’re in a “national emergency”, so who cares, right? (We’re still in a declared state of national emergency). Everyone knows that deploying 20,000 troops on U.S. soil violates Posse Comitatus and the Constitution. And everyone understands that staging troops within the U.S. to “help out with civil unrest and crowd control” increases the danger of overt martial law. But no one is asking an obvious question: Does the government’s own excuse for deploying the troops make any sense? Obama has presided over the most draconian crackdown on leaks in our history — even more so than Nixon. A 2003 FBI memo describes protesters’ use of videotaping as an “intimidation” technique, even though – as the ACLU points out – “Most mainstream demonstrators often use videotape during protests to document law enforcement activity and, more importantly, deter police from acting outside the law.” The FBI appears to be objecting to the use of cameras to document unlawful behavior by law enforcement itself. Obama has refused to reverse these practices. Some things — education, health, housing — should be rights, not financed through taking on more and more debt. Occupiers have joined anti-foreclosure advocates to occupy home auctions and abandoned buildings and block foreclosures. A few state attorneys general have begun resisting the Obama administration’s awful mortgage fraud settlement and started investigating banks and servicers. Even shareholders are in revolt, filing class action suits against their companies. 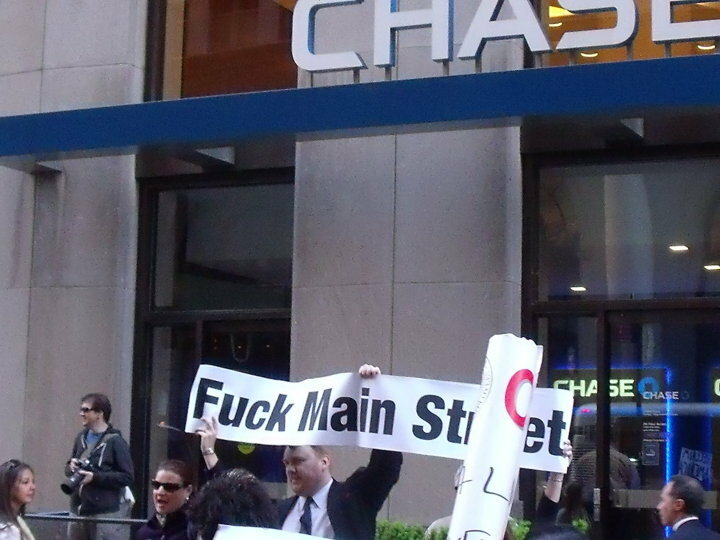 By one measure, student loans are one of the biggest concerns amongst supporters of Occupy Wall Street. There is now an OccupyStudentDebt. A petition to forgive student loans has gathered 300,000 signatures and was included as part of a general debt forgiveness bill on the floor of the House of Representatives. Congress has even begun to touch on medical debt issues. Taken together, we can say that these and other actions are the sign of growing resistance to key aspects of the social model of the past 30 to 40 years. We have been living in a society where debts, rather than rights, have been the major means for accessing basic social goods like housing, education, and health care. That social model was built around the assumption that while real incomes stagnated and the state did not directly provide many basic goods through universal entitlements, cheap credit would do the trick instead. High finance was inextricably intertwined with the privileges of citizenship. This was not a very good social model. With any luck, and a serious amount of political action, current resistance could lead to alternative ways of thinking about how we make these goods available to all. After all, while the previous decade has been represented as a debt-financed spending binge when consumers lived well beyond their means, it turns a complex story into a morality play. A major part of the credit ‘binge’ was about necessities, not luxuries. Sub-prime mortgages (especially with the decline of affordable housing) were the only way for many to become homeowners. Similarly, student loans were the only way for many to gain access to higher education and thus participate as equals in the radically unequal distribution of opportunity in the United States. The total value of student loans has surpassed total credit card debt, and is projected to top $1 trillion later this year. Mike Konczal posted the following graph at Rortybomb showing the dramatic rise of student debt. In a decade, student loans have gone from a third of consumer loans to far more than half. We find a similar story in health care. Two major national studies of medical indebtedness by a group of scholars, including Elizabeth Warren, have shown that illness and medical costs are a major cause of household bankruptcy. They noted that by 2001 “illness or medical bills contributed to about half of bankruptcies.” Notably, in their 2001 study, they found that 75.7 percent of medical debtorshad insurance at the onset of illness. Underinsurance, as much as lack of insurance, was a major financial burden. So too was loss of income due to illness (by their estimate, income loss is 40 percent of medical-related indebtedness). Worse yet, their follow up 2007 study of medical indebtedness notes that the “number of un- and underinsured Americans has grown; health costs have increased; and Congress tightened the bankruptcy laws.” That has led to a 50 percent increase in the proportion of bankruptcies attributable to medical problems. These bankruptcies, moreover, occurred in families only marginally worse than the median income and occupational class of American citizens. 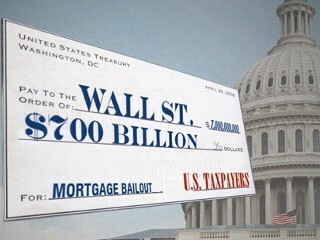 Once again, indebtedness is the product of the 99% trying to meet the costs of a basic good — health care. If there is a reasonable expectation that debtors can meet their interest payments then in theory debt is not a particularly bad way to finance access to certain goods. It is on the individual borrower to make a judgment about what constitutes a reasonable debt burden. It is frequently observed that the growth of finance sucked up the math and physics geniuses, who might have contributed something lasting to society, into hedge funds and investment banks to ruinous effect. But the alteration of professional choices is much wider than that. The number crunchers at the top were, one suspects, lured away by lucrative pay. The much more widespread, and difficult to measure, shift in career choices due to the discipline of debt burdens is probably the more important, and still ongoing, consequence of high student loans. Sign up to have the Daily Digest, a witty take on the morning’s key headlines, delivered straight to your inbox. If access to higher education were on the order of something like a right — a publicly financed good, provided at little or no cost, to ensure real equality of opportunity — then one can imagine a much different set of results. While conservatives like to talk about ‘freedom,’ this is a place where the left ought to have the upper hand in connecting economic practices to real freedoms. Providing necessary social goods, especially education, as a right rather than through debt not only reduces the disciplining effects of the latter. It also is a way of publicly recognizing and democratically defending the real freedoms of all citizens. To be clear, this is not a moralistic criticism of debt as evil or irresponsible. But there are very good reasons why society would not want to impose certain kinds of discipline on (most of) its citizens. Firstly, from a social point of view, people’s talents might be much more productively used in some other area than those that promise the most immediate monetary returns. There is no shortage of aspiring bankers and traders, but there is a primary care doctor shortage. Primary care doctors can graduate medical school with as much as $200,000 in debt. Debt-financed consumption was, in other words, a response to the declining ability of most households to afford existing rates of consumption, not an increasing ability or trust in future ability to pay back that debt. The entire social model, then, was built on a lie. The separation of consumption (financed by future promises to pay) from production (based on limiting present ability to earn) was a mirage. The problem has been that the underlying right to maintain a certain standard of living, or even to access to certain basic social goods like housing, health, and education, was just that: implicit. Every so often, of course, it was made somewhat public — for instance when Clinton or Bush would say something about providing housing to the poor and minorities who could not otherwise afford it (mainly by changing market incentives and promoting sub-prime borrowing, as it turned out). But this promise was always implicit and had to stay that way because it was mediated through the credit system. Access to these basic social goods was never a fully publicclaim each individual had against society. Instead, access to these social goods was a matter of a complex series of private, individualized claims against other private institutions like banks and employers, with the public role submerged in the form of altered market incentives. That is the difference between debt and right, and it is clear that the debt-based social model has failed. 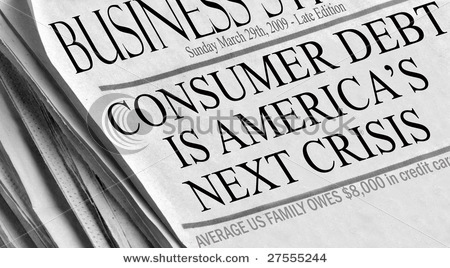 There are certainly some situations where debt-financed consumption is a perfectly good option. For instance, the current call for more fiscal austerity at the federal level is ideological claptrap. Moreover, any economy always has to take a bet on the future if it is going to innovate, especially since innovation always comes with the risk of failure. But there are certain kinds of basic goods that are better provided as a matter of universal right, both for the sake of the freedom of the persons who need those goods and as a matter of economic efficiency and productivity. We can have risk-averse graduates and a chronically ill workforce chained to underwater mortgages, or we can have healthy, well-educated citizens with enough security, and thus freedom, to take real risks in their lives. Alex Gourevitch a Post-Doctoral Research Associate at the Political Theory Project at Brown University. He also runs a blog calledThe Current Moment. Oldspeak:”When a totalitarian military regime starts taking its cues from an ostensibly free & democratic regime, it’s not good. “We saw the firm stance the US took against OWS people & the German govt against green protesters to secure the state” Monkey see, monkey do. What’s beginning to become clear is globally, the police state response to resistance, protest and dissent are strikingly similar. Overreaching shows of militarized force. Chemical warfare. Wildly disproportionate use of violence against peaceful and unarmed protestors. What doesn’t seem to be understood by the 1% though is violent responses only engender larger and stronger resistance and protest. Sooner or later the people who are choosing to ignore will be drawn into the fray, and then things will get really interesting. Will the state sponsored terrorism and violence continue to increase, or slowly abate? Two people were killed in Cairo and Alexandria this weekend as Egyptian activists took the streets to protest the military’s attempts to maintain its grip on power. And guess how the state is justifying its deadly crackdown. “We saw the firm stance the US took against OWS people & the German govt against green protesters to secure the state,” an Egyptian state television anchor said yesterday (as translated by the indispensable Sultan Sooud al Qassemi; bold ours). 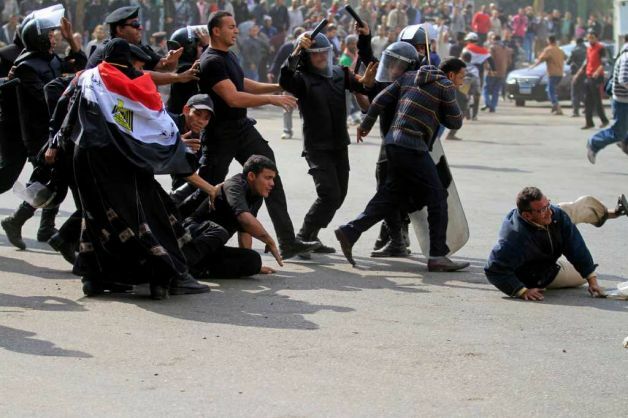 Note: American protesters are protesting for the same reasons as the Egyptian protesters. Truly, it is the people of the entire world versus the oligarchs and their mercenaries. His aunt, Alicia McWilliams, was honest about the tough streets her nephew was dealing with. “Newburgh is a hard place,” she said. So it was perhaps no surprise that in May, 2009, David Williams was arrested again and hit with a 25-year jail sentence. But it was not for drugs offences. Or any other common crime. Instead Williams and three other struggling local men beset by drug, criminal and mental health issues were convicted of an Islamic terrorist plot to blow up Jewish synagogues and shoot down military jets with missiles. Even more shocking was that the organisation, money, weapons and motivation for this plot did not come from real Islamic terrorists. It came from the FBI, and an informant paid to pose as a terrorist mastermind paying big bucks for help in carrying out an attack. For McWilliams, her own government had actually cajoled and paid her beloved nephew into being a terrorist, created a fake plot and then jailed him for it. “I feel like I am in the Twilight Zone,” she told the Guardian. Lawyers for the so-called Newburgh Four have now launched an appeal that will be held early next year. Advocates hope the case offers the best chance of exposing the issue of FBI “entrapment” in terror cases. “We have as close to a legal entrapment case as I have ever seen,” said Susanne Brody, who represents another Newburgh defendant, Onta Williams. Some experts agree. “The target, the motive, the ideology and the plot were all led by the FBI,” said Karen Greenberg, a law professor at Fordham University in New York, who specialises in studying the new FBI tactics. Another “entrapment” case is on the radar too. The Fort Dix Five – accused of plotting to attack a New Jersey army base – have also appealed against their convictions. That case too involved dubious use of paid informants, an apparent over-reach of evidence and a plot that seemed suggested by the government. Burim Duka, whose three brothers were jailed for life for their part in the scheme, insists they did not know they were part of a terror plot and were just buying guns for shooting holidays in a deal arranged by a friend. The “friend” was an informant who had persuaded another man of a desire to attack Fort Dix. Duka is convinced his brothers’ appeal has a good chance. “I am hopeful,” he told the Guardian. But things may not be that easy. At issue is the word “entrapment”, which has two definitions. There is the common usage, where a citizen might see FBI operations as deliberate traps manipulating unwary people who otherwise were unlikely to become terrorists. Then there is the legal definition of entrapment, where the prosecution merely has to show a subject was predisposed to carry out the actions they later are accused of. Theoretically, a simple expression, like support for jihad, might suffice, and in post-9/11 America neither judges nor juries tend to be nuanced in terror trials. “Legally, you have to use the word entrapment very carefully. It is a very strict legal term,” said Greenberg. But in its commonly understood usage, FBI entrapment is a widespread tactic. Within days of the 9/11 terror attacks, FBI director Robert Mueller issued a memo on a new policy of “forward leaning – preventative – prosecutions”. Often they just seem to be “fishing expeditions”. In the Newburgh case, the men involved met FBI informant Shahed Hussain simply because he happened to infiltrate their mosque. In southern California, FBI informant Craig Monteilh trawled mosques posing as a Muslim and tried to act as a magnet for potential radicals. Monteilh, who bugged scores of people, is a convicted felon with serious drug charges to his name. His operation turned up nothing. But Monteilh’s professed terrorist sympathy so unnerved his Muslim targets that they got a restraining order against him and alerted the FBI, not realising Monteilh was actually working on the bureau’s behalf. Muslim civil rights groups have warned of a feeling of being hounded and threatened by the FBI, triggering a natural fear of the authorities among people that should be a vital defence against real terror attacks. But FBI tactics could now be putting off many people from reporting tip-offs or suspicious individuals. “They are making mosques suspicious of anybody. They are putting fear into these communities,” said Greenberg. Civil liberties groups are also concerned, seeing some FBI tactics as using terrorism to justify more power. “We are still seeing an expansion of these tools. It is a terrible prospect,” said Mike German, an expert at the American Civil Liberties Union and a former FBI agent who has worked in counter-terrorism. German said suspects convicted of plotting terror attacks in some recent FBI cases bore little resemblance to the profile of most terrorist cells. “Most of these suspect terrorists had no access to weapons unless the government provided them. I would say that showed they were not the biggest threat to the US,” German said. Also, some of the most serious terrorist attacks carried out in the US since 9/11 have revolved around “lone wolf” actions, not the sort of conspiracy plots the FBI have been striving to combat. The 2010 Times Square bomber, Faisal Shahzad, only came to light after his car bomb failed to go off properly. The Fort Hood killer Nidal Malik Hasan, who shot dead 13 people on a Texas army base in 2009, was only discovered after he started firing. Both evaded the radar of an FBI expending resources setting up fictional crimes and then prosecuting those involved. Yet, as advocates for those caught up in “entrapment” cases discover, there is little public or judicial sympathy for them. Even in cases where judges have admitted FBI tactics have raised serious questions, there has been no hesitation in returning guilty verdicts, handing down lengthy sentences and dismissing appeals. The Liberty City Seven are a case in point. The 2006 case involved an informant, Elie Assaad, with a dubious past (he was once arrested, but not charged, for beating his pregnant wife). Assaad was let loose with another informant on a group of men in Liberty City, a poor, predominantly black, suburb of Miami. The targets were followers of a cult-like group called The Seas of David, led by former Guardian Angel Narseal Batiste. The group was, perhaps, not even Muslim, as its religious practices involved Bible study and wearing the Star of David. Yet Assaad posed as an Al-Qaida operative, and got members of the group to swear allegiance. Transcripts of the “oath-taking” ceremony are almost farcical. Batiste repeatedly queries the idea and appears bullied into it. In effect, defence lawyers argued, the men were confused, impoverished members of an obscure cult. Yet targets the group supposedly entertained attacking included the Sears Tower in Chicago, Hollywood movie studios and the Empire State Building. Even zealous prosecutors, painting a picture of dedicated Islamic terrorists, admitted any potential plots were “aspirational”, given the group had no means to carry them out. Nonetheless, they were charged with seeking to wage war against America, plotting to destroy buildings and supporting terrorism. Five of them got long jail sentences. Assaad, who was recently arrested in Texas for attempting to run over a policeman, was paid $85,000 for his work. This year the jailed Liberty City men launched an appeal and last week judgment was handed down. They lost, and officially remain Islamic terrorists hell-bent on destroying America. Not that their supporters see it that way. “Our country is no safer as a result of the prosecution of these seven impoverished young men from Liberty City,” said Batiste’s lawyer, Ana Jhones. Oldspeak:“Why is President Obama who ostensibly has expressed understanding and sympathy for Occupy protests, instead surreptitiously allowing federal law enforcement agencies to assist, advise, coordinate and plan tactics to raid and break up Occupy encampments? I wondered why all these ‘crackdowns’ happened in much the same militarized way, around the same day, around the same time in the dead of night in 18 cities. ‘According to one Justice Department official, each of those actions was coordinated with help from Homeland Security, the FBI and other federal police agencies. In several recent conference calls and briefings, local police agencies were advised to seek a legal reason to evict residents of tent cities, focusing on zoning laws and existing curfew rules. Agencies were also advised to demonstrate a massive show of police force, including large numbers in riot gear. In particular, the FBI reportedly advised on press relations, with one presentation suggesting that any moves to evict protesters be coordinated for a time when the press was the least likely to be present.” Given this information, we have to ask ourselves, in the ‘land of the free’; WHY? Why the Gestapo-like tactics? 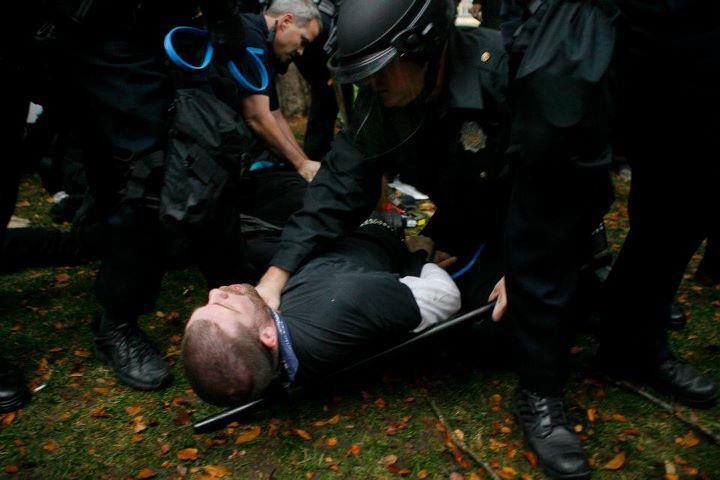 Why the hyper-militarized and violent responses to non-violent civil disobedience? Why the suppression of freedoms of assembly, press and speech? More change I can’t believe in. The FBI has so far failed to respond to requests for an official response, and of the 14 local police agencies contacted in the past 24 hours, all have declined to respond to questions on this issue. But in a recent interview with the BBC,” Oakland Mayor Jean Quan mentioned she was on a conference call just before the recent wave of crackdowns began. At the time this story was updated, Mayor Quan’s office had declined to discuss her comments. UPDATE: Thursday, 11:30 a.m. CT Two civil rights legal groups have filed a comprehensive Freedom of Information request for any and all communications between federal law enforcement agencies and local police that are related to the “Occupy” protests. UPDATE: Thursday, 10:15 a.m. CT. I was finally able to get an official response from the Dept. of Homeland Security, although it didn’ address many of my questions. I was also able to speak with several high-ranking DHS officials on background and deep background, which helped answer a few logistical questions (for instance, the role of the department’s Federal Protective Service). UPDATE: Wednesday, 12:45 p.m. CT. Speaking of Homeland Security, the department’s Federal Protective Service (which is tasked with protecting federal buildings) has been spotted at a couple of ‘Occupy’ crackdowns, including one in Portland. UPDATE: Wednesday, 11:15 a.m. CT. Here are a couple of relevant links that are related to this story. Filmmaker Michael Moore was on “Countdown With Keith Olbermann” last night talking about this very issue. Click here to see the video. The Associated Press has published a great piece on another set of conference calls about strategy, these organized by the Police Executive Research Forum. UPDATE: Wednesday, 10:10 am CT. I’m working on at least one new story for today, but I wanted to try and clear up a couple of questions I’ve gotten since this original story posted yesterday. I have a hunch that Mayor Quan might have been referring to a conference call between a number of U.S. mayors in her interview, not one with law enforcement officials. But that’s just a hunch on my part, since her office has so far declined to offer any explanation of her comments to me. My original source for the story (who still works at the Justice Dept.) stands behind the original story and we’re working to flesh it out in more detail today. I also have some other aspects of the story I’m working on as well. I’ll post a link to my next story here or if you want to be automatically notified, subscribe to my feed here. For days now, we have endured demonstrably false propaganda that the fallen soldiers of U.S. wars sacrificed their lives for “our freedoms.” Yet, as that noxious nonsense still lingers in the air, militarized police have invaded OWS sites in numerous cities, including Zuccotti Park in Lower Manhattan, and, in the boilerplate description of the witless courtesans of the corporate media, with the mission to “evict the occupiers”. Hundreds of NYC riot police forcibly evicted Occupy Wall Street from Zuccotti Park early on Tuesday, Nov. 15, 2011.U.S soldiers died protecting what and who again? These actions should make this much clear: The U.S. military and the police exist to protect the 1%. At this point, the ideal of freedom will be carried by those willing to resist cops and soldiers. There have been many who have struggled and often died for freedom–but scant few were clad in uniforms issued by governments. Freedom rises despite cops and soldiers not because of them. And that is exactly why those who despise freedom propagate military hagiography and fetishize those wearing uniforms–so they can give the idea of liberty lip service as all the while they order it crushed. When anyone tells you that dead soldiers and veterans died for your freedom, it is your duty to occupy reality and inform them of just how mistaken they are. And if you truly cherish the concepts of freedom and liberty, you just might be called on to face mindless arrays of fascist cops and lose your freedom, for a time, going to jail, so others might, at some point, gain their freedom. My father was employed at a scrap metal yard but also worked as a freelance photojournalist who hawked his work to media photo syndicates such as Black Star who then sold his wares to the major newsmagazines of the day. A number of the iconic photographs of the era were captured by his Nikon camera e.g., of vicious police dogs unleashed on peaceful demonstrators; of demonstrators cartwheeled down city streets by the force of fire hoses; of Dr. King and other civil rights marchers kneeled in prayer before arrays of Police Chief Bull Connor’s thuggish ranks of racist cops. 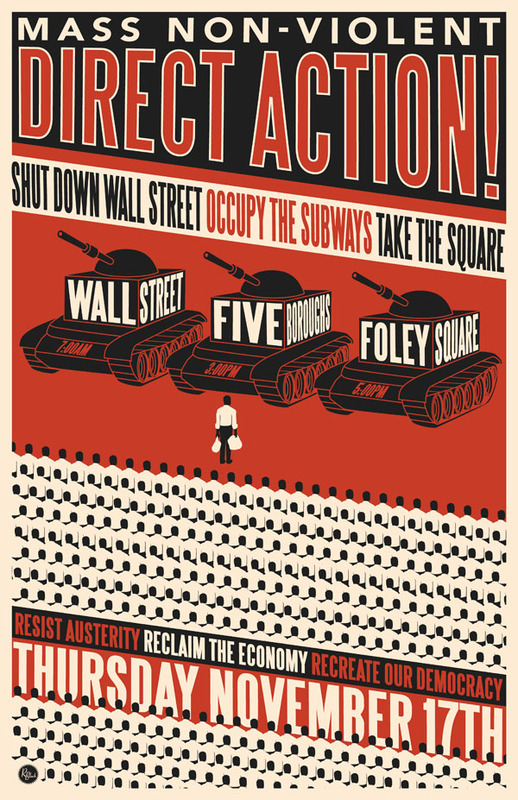 And the same situation is extant in the growing suppression of the OWS movement in various cities, nationwide, including Liberty Park in Lower Manhattan. The 1% and their paid operatives–local city officials–are striving to protect an unjust, inherently dishonest status quo. Lacking a moral mandate, they are prone to the use of police state forms of repression. Dr. King et al faced their oppressors on the streets of my hometown. Civil Rights activists knew that they had to hold their ground to retain their dignity…that it was imperative to sit down in those Jim Crow-tyrannized streets when necessary in order to stand up against the forces of oppression. At present, we have arrived at a similar moment. If justice is to prevail, it seems, the air of U.S. cities will hold the acrid sting of tear gas, the jails will again be filled, the brave will endure brutality–yet the corrupt system will crumble. Because the system’s protectors themselves will bring it down by revealing its empty nature, and the corrupt structure will collapse from within. This is inaccurate (at best) reportage. It suggest that both parties are equal aggressors in the situation, and the motive of the police is to restore order and maintain the peace, as opposed to, inflicting pain and creating an aura of intimidation. This is analogous to describing a mugging as simply: two parties engaging in a financial transaction. Although mainstream media demurred from limning the upwelling of mob violence at Penn. State as involving any criteria deeper than the mindless rage of a few football-besotted students unloosed by the dismissal of beloved sport figure. Yet there exists an element that the Penn. State belligerents and OWS activists have in common: a sense of alienation. Penn. State students rioted because life in the corporate state is so devoid of meaning…that identification with a sports team gives an empty existence said meaning…These are young people, coming of age in a time of debt-slavery and diminished job prospects, who were born and raised in, and know of no existence other than, life as lived in U.S. nothingvilles i.e., a public realm devoid of just that–a public realm–an atomizing center-bereft culture of strip malls, office parks, fast food eateries and the electronic ghosts wafting the air of social media. Contrived sport spectacles provisionally give an empty life meaning…Take that away, and a mindless rampage might ensue…Anything but face the emptiness and acknowledge one’s complicity therein, and then direct one’s fury at the creators of the stultified conditions of this culture. Accordingly, we should not only occupy–but inhabit our rage. No more tittering at celebrity/political class contretemps–it is time for focused fury. The machinery of the corporate/police state must be dismantled. If the corporate boardrooms have to be emptied–for the oceans to be replenished with abundant life–then so be it. If one must go to jail for committing acts of civil disobedience to free one’s heart–then it must be done. Yet why does the act of challenging the degraded status quo provoke such a high decree of misapprehension, anxiety, and outright hostility from many, both in positions of authority and among so many of the exploited and dispossessed of the corporate/consumer state. For example, why did the fatal shooting incident in Oakland, California, Nov. 1, that occurred near the Occupy Oakland Encampment–but, apparently, was wholly unrelated to OWS activity cause a firestorm of reckless speculation and false associations. Because any exercise in freedom makes people in our habitually authoritarian nation damn uneasy…a sense of uncertainty brings on dread–the feeling that something terrible is to come from challenging a prevailing order, even as degraded as it is. Tyrants always promise safety; their apologist warn of chaos if and when the soul-numbing order is challenged. Granted, it is a given that there exists a sense of certainty in a prison routine: high walls and guards and gun mounts ensure continuity; an uncertainty-banishing schedule is enforced. Moreover, solitary confinement offers an even more orderly situation…uncertainty is circumscribed as freedom is banished. 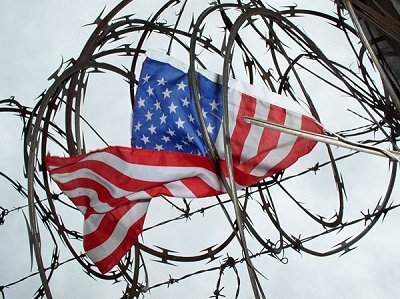 The corporate/national security state, by its very nature is anti-liberty and anti-freedom. Of course, its defenders give lip service to the concept of freedom…much in the manner a pick-pocket working a subway train is very much in favor of the virtues of public transportation. A heavy police presence has ringed Zuccotti Park from the get-go, and whose ranks have now staged a military style raid upon it, a defacto search and destroy mission–because the ruling elite want to suppress the very impulse of freedom. These authoritarian bullies don’t want the concept to escape the collective prison of the mind erected and maintained by the corrupt jailers comprising the 1% who claim they offer us protection as, all the while, they hold our chains…all for our own good, they insist…for our safety and the safety of others. Although, from studying on these prison walls, the thought occurs to me…that what we might need is protection from all this safety. International Day Of Action Nov. 17th 2011. Mass Non-Violent Direct Action.